My husband and I purchased Einstein and Aristotle, from Heather. They were 9 months apart, in age. Einstein was a gorgeous big yellow Lab. He was one of the strongest dogs I've ever know. Aristotle was my Therapy Dog. His beautiful white color caught everyone's eye, constantly. He encouraged many elderly and sick people. They were both wonderful dogs. Einstein was the first dog we purchased, from Heather. We were so impressed with Heather, her dogs, and her love for the breed, that we have three more, of Heather's boys, now. I wouldn't get a dog anywhere else. Heather's dogs have the prettiest heads and they are so physically sound. Hi Heather, there are no words to explain the joy that Gunner Kenji has brought to our home. In the beginning, we had a personal trainer come to our home to train Gunner. As it turns out, we needed the training more than Gunner did. He is so smart. He loves to have someone bounce tennis balls so that he can catch them. It is so amazing how great a catcher he is. Any baseball team would be lucky to have him. LOL!! 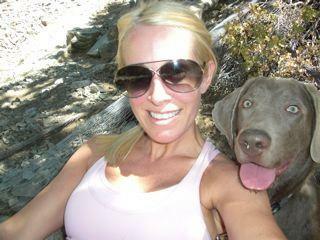 He also loves to go camping & swimming. We have a motorhome and he has to share the passenger captain's chair with whomever is sitting in it. He sits like a human in that captain's chair and will ride for hours. He is very loving and loyal to both of us. He also loves to play with other dogs and is very good with children. We could go on forever about him! We are so proud!! We can't thank you enough for all of your help & patience. I know we had alot of questions in the beginning, but it was so nice to know that you were always there with answers. 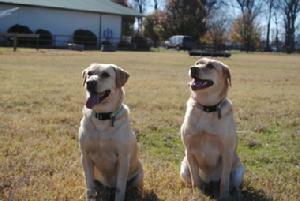 Your care & devotion to your puppies definately showed when we picked Gunner up from you. We highly recommend you as a breader to all of our friends here in Louisiana. We would definately purchase another puppy from you when the time is right. It�s been almost 6 years since we drove out to meet you and I knew when we saw Avery that we weren�t leaving without her. I can still remember driving straight from your house to Petsmart to load up on the essentials! 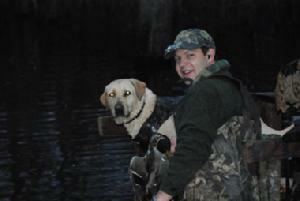 She has been a wonderful dog, the best I�ve ever hunted with. She is so smart, and sometimes I�m amazed at the things she does. 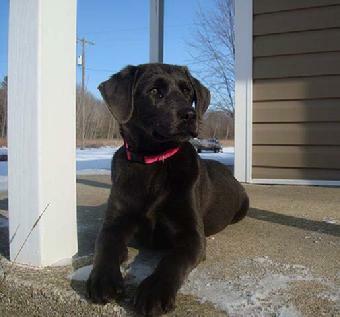 She is a beautiful lab and looks just like her father, Will. A few years later we decided she needed a playmate and were thrilled to hear that Sugar and Will were having another litter. Ellie has the most loving personality and was always by Anne�s side during her pregnancies and keeps an eye on our boys all of the time. Aside from her color, I think she looks just like Sugar. Her nose is a little slimmer and the have the same look in their eyes. 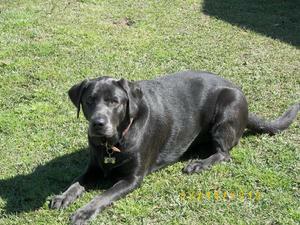 She and Avery are best of friends and I can�t imagine our family without them. 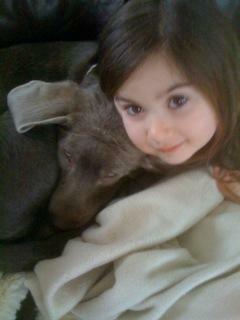 We were so appreciative for all of the help that you gave us when we were first looking to get a puppy. We always knew that we could count on you if we had any questions and have enjoyed staying in touch with you over the years. You have done such a wonderful job breeding quality labs and making sure that your puppies are in top health before leaving the litter. I�m not looking forward to the day I come looking again because that will mean that one of mine is gone. However, when that time comes I know that I won�t have to look far to find another healthy and beautiful lab to join our family. Here's some pics! We absolutely love Ronnie. He is such a good natured dog and calm! He sleeps with us and takes up all the room, he's sooo big and goofy. He's a great family dog and great with our 4yr old daughter. He's a real beauty! Just wanted to drop you a note and send some pics of Lucy Mae. She is a BEAUtiful, happy, healthy, dog. She has the sweetest personality, she is so smart, and she is just an overall lovely girl! I can't thank you enough! She LOVES to hike, play ball, and she is very curious. She is a tad mischievous, but aren't all puppies. I see you have a picture of her sister on your site....they could be twins! I have given your information to quite a few people.....everyone comments on what a gorgeous girl she is! Hope all is well with you and thanks again! Here are a couple pics of our sweet, "Benilli Magnum". He is the BEST dog I know. He is very smart, playful and just full of energy, and of course SPOILED ROTTEN. He loves to retrieve and play. He is growing like a weed. Everybody that sees him can not beleive how big he is for his age. Thank you so much for providing us with such a great dog. We will definitely buy another one from you in the future. Thanks, Tammy & Chris . Hello Heather! It's Dani from your litter of Juno and Ruger (Oct). I've been meaning to send you a note much, much earlier, but things are crazy as usual. I just wanted to tell you how thankful we are to have found you. Lilly is my newest daughter, and although she is close to an antichrist at times, we couldn't live without her! My husband breaks into a smile and a schmoopy voice as soon as he sees her. He has taught her to get the newspaper in the mornings. She is growing by the minute. Our vet is in love with her as well as all the techs. She's a little over 5 mos and about 40ish lbs. She took to our Choc Lab and they are inseparable. I will send pics as soon as I find one that doesn't show my messy house in the background. I will email you as soon as I can with some shots. She goes to get 'fixed' on Friday. My husband is a nervous-nelly and keeps telling her it will be ok, and not to hate him...(yep, he's the macho police officer). I hope your family is healthy and spring is starting to show by you! Thanks again!!! 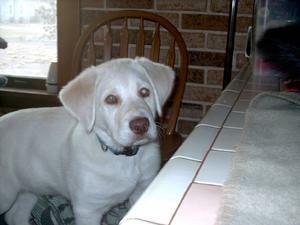 Heather happen to think of you today and thought I would share a picture of Ghost. He is a great dog, maybe the smartest one we have ever own. Once he understands what you want he does it from then on when ask. He is still putting on more muscle even from when this picture was taken. He will be a year old April 15. We have never seen a Lab that can run as fast as he does. We think we got a heck of a deal on a wonderful dog.